Author: Jelle Cammenga. Series edited by: Bernd Heine, Wilhelm J.G. Möhlig. Gusii is an East Nyanza Bantu language (Guthrie’s classification E.42) spoken by at least one million people (www.ethnologue.org: 2.12 millions, 2006). Beyond the level of dialectal variations, it is closely related to other Bantu languages of the region, namely to Kuria, Mfangano and Suba. Although, with respect to the number of speakers, the Gusii language still has a regional importance in Kenya, it is little known. The author did his field research on the grammar of Gusii in the years 1996 and 1997. He has widened our knowledge on the linguistic inventory and structure of the Gusii language considerably, understanding his grammatical description of Gusii as a direct continuation of Wilfred Whiteley’s pioneer work from 1956 and 1960 that, for a long time, had remained the only printed source of the language. He frequently formulates his own findings with reference to Whiteley’s statements confirming, correcting or complementing them. In this way, Gusii next to Kuria (E.43) has become one of the best-documented Bantu languages of South West Kenya. From the Africanist's point of view, there are still three major gaps in the research record of Gusii to be filled: a thorough analysis of the prosodological (tonal) system, a comprehensive dictionary and a scholarly edition of local verbal art. These studies are somehow urgent, because the language is under heavy pressure of Lwoo, a Nilotic language and Swahili. The new socio-linguistic development is to the detriment of Gusii in so far as it is more and more ousted from the public domain and subject to massive linguistic influence from Lwoo and Swahili. In this perspective, the appearance of the author’s comprehensive and meticulous description of Gusii is highly welcomed. By the same author, another grammar Igikuria Phonology and Morphology. 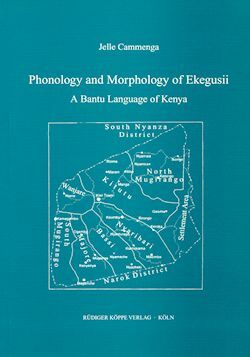 A Bantu Language of South-West Kenya and North-West Tanzania was published by us in the same series, featuring the Kuria language (E.40) which is most closely related to Gusii.